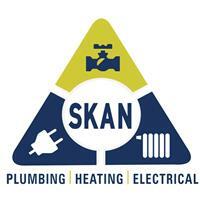 SKAN Plumbing Heating Electrical - Central Heating Engineer, Electrician, Plumber based in Waterlooville, Hampshire. Skan Plumbing & Heating is a well-respected Plumbing, Heating & Electrical company serving Waterlooville and surrounding towns in Hampshire & West Sussex. We specialise in boiler and full heating installations, pipe work and plumbing repairs, and everything electrical including faults, testing, inspection and installation. With over 25 years professional experience in the industry, there's no job too big that we can't take care of in a clean, efficient and professional manner. We are fully accredited members of GasSafe and NICEIC. We are also on hand for any emergencies you may have, day or night. Our emergency plumbing and electrical team is available around the clock, every day of the week to help deal with whatever your plumbing or electrical decides to throw at you – from a snapped tap gushing water everywhere, to coming home to a broken pipe and finding water all over your floor. We aim to attend emergency calls within 30 minutes, whatever time you call us.